Added versatility and enhanced performance. Our Butcher Bin is compact, mobile and efficient. A great addition to any kitchen. Use it for rolling out pastry dough...it will not stick. Carve, with confidence the largest turkey, slab of beef or rack of lamb. Slice, dice or julienne fresh fruit and vegetables...like a pro. 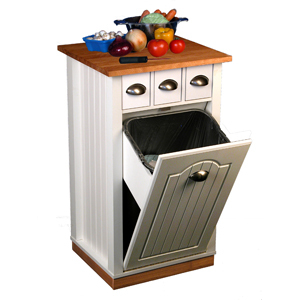 Unique design incorporates a storage compartment for food scraps or other refuse. We increased this cabinets versatility by adding 3 pantry shelves and a paper towel holder in the rear. Hidden casters behind real hardwood skirt offer smooth and easy mobility. Item Weight: Approximately 57 lbs.